November 16, 2017, Oxford, England & San Francisco, California - Oxford Genetics, a leader in innovative synthetic biology-based technologies for biologics discovery, development and delivery, announced today a new licensing agreement with Twist Bioscience Corporation, a company enabling customers to succeed through its offering of rapid, high-quality synthetic DNA. Oxford Genetics will supply Twist Bioscience with its SnapFast™ technology platform to provide a broad range of application-specific expression vectors which Twist Bioscience will use to clone synthesized DNA for its diverse customer base. 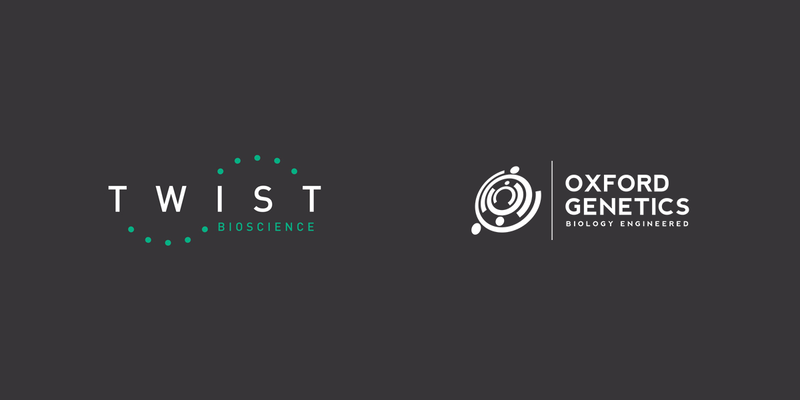 Dr Ryan Cawood, CEO of Oxford Genetics said, “This license agreement with Twist Bioscience serves as further recognition of our approach to developing the best optimised expression vectors. Oxford Genetics specialises in the design of application specific vectors, which is a culmination of access to cutting edge bioinformatics, generation of extensive biological data, and continual refinement to ensure customer success. The vectors also grant access to the wider SnapFast™ ecosystem which allows Twist Bioscience to switch between all of Oxford Genetics’ vectors, making future changes and additions simple and efficient. Emily M. Leproust, Ph.D., CEO of Twist Bioscience commented, “By complementing our ability to provide high throughput synthetic genes with a wide range of customized vectors from Oxford Genetics, we accelerate our customer’s workflow, allowing them to solve more complex problems while saving both time and resources. Importantly, it enables us to reach the large group of customers who order smaller quantities of genes in standard vectors.